If you like mochas and macchiatos, you're probably familiar with the florescent lighting of your local cafe. It can be tough to find a coffee maker that brews your specialty drinks as nicely as a professional unit, especially if you don't want to hack off an arm and a leg to pay for it. We were in the same boat, coasting the same waters, when we discovered the Ninja Coffee Bar. So let's take a look at our review of the Ninja Coffee Bar Brewer. If you're in a hurry, jump straight to our '﻿Verdict' part. You might be familiar with Ninja already. They're a company known for their blenders, mixers and juicers, and they've built up a good reputation for their high-quality products that work... well, like ninjas. They've recently turned their efforts to coffee, and the results are as excellent as you'd expect. The Ninja Coffee Bar is everything that we could want in a home coffee station. It's gotten to the point where we don't even visit coffee shops anymore. If you're hoping to cut the cord with your own Starbucks, here's a review of the Ninja Coffee Bar that might open your eyes like it opened ours. With a dazzling array of features, functions, options, controls and adjustments, the Ninja Coffee Bar offers a customized cup of coffee whenever and however you'd like. That's a lot of supplies, and each has a place and purpose when brewing a good cup of coffee. Let's break them down. The Ninja Coffee Bar can be used to create everything from hot dripped coffee to iced latte drinks. The key to its versatility is its control panel. Partly digital and partly comprised of old-school buttons and dials, it will let you brew whatever you're in the mood to brew. Do you like standard black coffee without any surprises? Or do you prefer a deeper, richer flavor to really wake you up after a long night? Choose "classic" or "rich" mode. Are you a fan of iced coffee beverages? Do you hate when the ice melts and leaves your drink watered down to complete tastelessness? Choose the "over-ice" brew that will deliberately strengthen your coffee's concentration to accommodate melting ice in the future. Do you enjoy making your own cappuccinos and café au laits? Choose "specialty" mode to brew hot and cold beverages just like your local coffeehouse. Who needs Starbucks when you have a ninja at your disposal? The Ninja Coffee Bar measures 10.8 x 10.5 x 14.9 inches and weighs 8.2 pounds. That's pretty standard for a brewing unit, but keep in mind that its many accessories will also need counter space. It isn't just a coffee maker; it's an entire coffee bar. You'll need room to spread everything out. In terms of cup size, the Ninja Coffee Bar can make both single-serve cups and large, office-satisfying pots. You can prepare small mugs to be consumed with the morning paper or large thermoses to take with you during your commute. Again, the Ninja Coffee Bar is all about convenience, so just about everything is adjustable. You'll be in control of your own caffeine experience. Our favorite feature of the Ninja Coffee Bar is its Auto-iQ One-Touch Intelligence function. It's a mouthful, but it basically means that you only need "one touch" to get your coffee going. The machine will automatically calibrate the necessary temperature and water saturation for your chosen drink. You won't have to worry about messing up some small detail of your brew and ruining the entire carafe. You might also like the Ninja Coffee Bar's Thermal Flavor Extraction technology, a delicately-calibrated blending system that will whip your drink into shape while also pulling out the full flavor potential of your grinds. There are other features to enjoy about the Ninja Coffee Bar, too. For example, there's a "drip stop" button for when you need to pause your brewing without making a mess. There's an auto-off feature that will shut down the machine after two hours of inactivity. You can even set the timer and hit the "delay brew" button to prepare your coffee at a predetermined time. Make it fire up while you're still in bed; remind it to brew a fresh cup every hour while you're plowing through work forms. Its clock can be adjusted down to the minute and with both AM and PM times. Oh, and don't forget the milk frother! You can add a lovely layer of crema to your coffee beverage by using the frother to aerate your two percent. It'll taste just like a barista did it, but you'll get to have all of the frothy fun yourself. You'll have your choice of plain, rich or specialty modes to control your own caffeine experience. A few drawbacks keep the Ninja Coffee Bar from being a perfect machine. The Ninja Coffee Bar is a great coffee maker; there's no doubt about that. But we'd be remiss if we didn't talk about the potential downsides of making it your main source of java. The big flaw of the Ninja Coffee Bar is its tendency to overbrew its drinks. As confirmed by independent tests, its internal temperatures can get up to 208°F. That's slightly too high for the optimal cup of coffee. You'll need to beware the bitterness or just use less of the machine's "rich" brewing modes. The design of the Ninja Coffee Bar leaves a lot to be desired. Though it tries to replicate the sleek, chrome appearance of high-end coffee makers, the truth is that it's made of plastic. Most components are black, so it's not immediately noticeable as a cheap-looking instrument, but you won't be able to fool anyone who actually uses it. Another potential issue is the amount of counter space that the Ninja Coffee Bar requires. Between its brew stations, milk frothers, water tanks and plastic carafes, you'll have a lot of pieces to arrange. Throw in the recipe book and instruction manual, and you'll need drawer space as well. We've already talked about the measurements of the Ninja Coffee Bar, so we won't belabor the point. It's just something to think about if your kitchen is already crammed with appliances. The plain design won't be winning any awards. 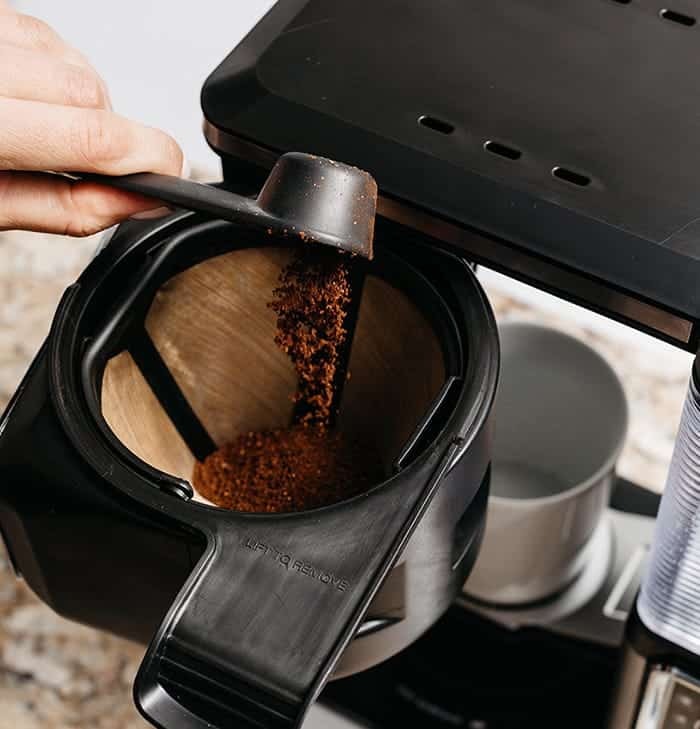 All in all, the cons of the Ninja Coffee Bar don't outweigh the pros, but you should still be aware of these things if you're trying to make a smart purchase decision. In case you're a visual person, here is a video review of the Ninja coffee bar. No coffee maker is perfect, but the Ninja Coffee Bar makes a worthwhile attempt. The Ninja Coffee Bar will live up to its name by serving as an all-in-one coffee station in your home. 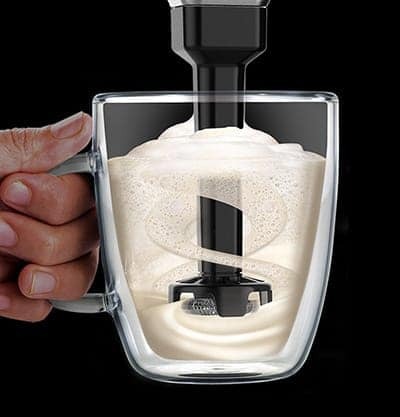 Whether you enjoy plain black coffee or specialty lattes with lots of lathered foam and ice, this is a machine that can get the job done. It isn't without flaws, of course, but none of them stand out as a reason not to buy the unit. If you're worried about bitter coffee, just choose a regular brew mode instead of an extra-concentrated one. If you don't like the plastic ribbing of its water tank, remind yourself that the plastic is protecting great technology inside it. You don't even have to worry about cost. The Ninja Coffee Bar retails at around $100-$150 depending on the store, and while that's not the lowest price tag on the market, it's very fair considering how much the Ninja Coffee Bar has to offer. You can get all of its functions and features without blowing your entire pay check on it! At the end of the day, the Ninja Coffee Bar is more than just a coffee maker. It's an entire coffee experience wrapped inside a single machine, and that's why it's one of our favorites. I’ve plugged in my ninja to 2 different outlets and causes the strip used to turn off. Does the ninja use more power than normal coffeepots, this never happened with my old coffeepot? Should I return my ninja? That’s a weird issue, never happened to me. Please contact their customer support at the earliest. How long will this coffee bar last? Wats with tbe clean button?? Its spoiling the whole machine. It lights up every third brew.. Its horrible.. I wish i cud disconnect it. Same here. We’ve cleaned it for a full day, and the clean button still lights up. It’s about to be a deal-break for us. Do you have very hard water? Keurigs recommend distilled or purified water for their machines perhaps hard water is triggering the sensor technology for cleaning. we bought the ninja because it would make a full pot of coffee, as well as a single cup for when we are on the go. The first thing we noticed it was not making a full pot, so we checked the settings, we also made sure the water reservoir was resting in its proper place, that did not seem to be a problem. we found that if we brewed the partial pot then removed the water reservoir and reattach it, it would finish making a full pot. Then the cleaning light came on and within a month after it was purchased. We cleaned it according to the instructions and within two weeks of that cleaning the cleaning light was on again. We were done with it… Its no better than a $5.00 coffee maker at a garage sale. We’re looking for a new coffee machine that offers more features, and this one seemed perfect. I appreciate your honesty and sharing your story of the…um…..EXPERIENCE you had with the company, so I cannot thank you enough! Do not buy this coffee pot. Not worth the money. I purchased three, one for me and 2 for gifts. Cleaning light stays on so don’t know when it really needs cleaning. Called and given 2 different methods to clean. The water canister quit dispensing water. Called 3 times and finally got someone to help. Sent a new base out about three months ago and it is now doing the same thing. Very disappointed. Have the ninja coffee bar, month after use, the clean light came on, did cleaning as instructed, light still on and now the clock doesn’t work. Purchased my second Ninja Coffee Bar with thermal carafe. My daughter took the first one because the clean light continued to stay on after numerous cleaning attempts. This second one does the same thing. We have followed the cleaning instructions to the letter, and mostly use spring and purified water for our coffee. I called warrantee department at Ninja and was told to ignore the light. Not the correct answer! I will be enjoying my coveted morning cup made with another brand soon. If anyone wants a slightly used, defective, free Ninja coffee bar… hit me up. That’s sad and thanks for sharing! I always had a good experience with the Ninja customer support. I purchased the ninja coffee bar about 1 1/2 years ago. Besides the clean button coming on as soon as I finish cleaning it. I am now having a brewing problem. When the cup of coffee is brewing the coffee maker is very noisy (as if the water inside is boiling) and there is a lot of steam coming out. Once the brewing is complete, I end up with about 1/4 cup or so less coffee then normal. We purchased this product in an effort to replace our old system that worked fine but DID NOT have a warming plate. (Why should the second family member looking for a morning cup of coffee need to microwave their mug?) After looking at the Ninja coffee maker in the store we thought this new brewer was for us. It had the warming plate that would keep the coffee hot in between users and some cool ice coffee and capachino options. Boy, were we wrong. Unpacked the product, assembled it and read the instructions. Knowing that it would be a good idea to do some test runs that would clean out the machine we brewed a pot of hot water. Great. We reread the instructions and discovered that the manufacturer suggested that the user run two cycles to make sure there is no residue coming out in the process. And that where our new machine decided to throw in the towel. The brew basket slides into a slot and the ready brew light should go out. (Sorry, I don’t have the machine in front of me to confirm the exact word on this button.) Regardless this light should go out meaning the basket is firmly engaged at the top and hot water will start flowing across your coffee grounds . We got one brew cycle and that was that. Seems the connections at the top crapped out. Nothing was forced and there is no debree in the way of the sliding basket. It’s as if the internal wiring was never connected or put together with barely a thread designed to snap after one cycle. A call to customer service has not helped since our purchase feel on a weekend but in all honesty what are they going to do? Suggest we put it back in the box, drive to UPS, insure it and wait for a replacement and the eventual return of our shipping costs. This whole process will take weeks and the way this first one was designed I have no faith that a replacement will do any better. After reading all the reviews in this thread it seems as if nobody has luck with clean cycle lights and their brewers have stopped working. It’s just my opinion but tbe wiring inside must be made horribly!! Hopeful that we’ll eventually get a new machine but a brand new system straight of the box should work for a while. All ours did was make us sad. Given one by family this past holiday. First problem, it would not brew at all. After talking with customer service, I was send a new unit in March 2018 for $20. October, it will not brew without having to restart the unit every 10 seconds. Have already purchased a machine from another company. Under no circumstances would I recommend the Ninja Coffee Bar.